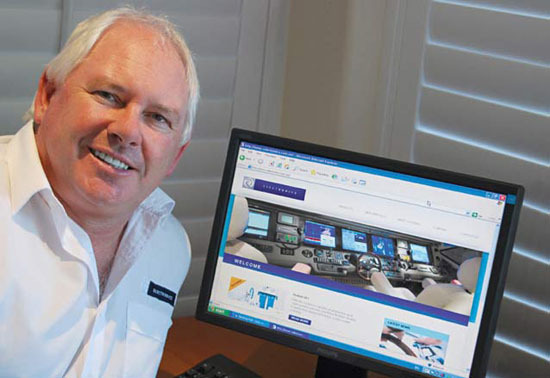 Marine electronics and navigation guru, Errol Cain has supervised the installation of marine electronic systems into thousands of luxury cruisers in his 22 years experience. This issue Errol will discuss the new HRO Seafari super-compact watermaker. R Electronics has recently launched the new HRO Seafari Mini 550 and 750 watermakers. As the saying goes, ‘good things come in small packages’ and this super-compact watermaker is no exception. The 750 produces 117 litres per hour while the 550 produces 87 litres per hour, giving it the largest production capacity for its size. R Electronics managing director, Errol Cain, said the Seafari Mini was a very compact design to fit in tighter spaces or on smaller vessels. “The new HRO Seafari Mini is one of the smallest watermakers available, it takes up less room on board but makes a large capacity of water for its size,” Errol said. “It is extremely quiet and has complete vibration isolation as well as HRO’s exclusive Solid Salinity Meter for water monitoring. Errol said HRO was the number one brand in Australia. “They have sold more water makers than any other brand and have been building water makers for the past 30 years so it is a reliable product that is leading the field in new technology,” Errol said. “R Electronics will be making water on the dock at the Sanctuary Cove International Boat Show so I encourage people to come along and pick up a bottle of freshly made water and taste it for your self. The new HRO Seafari Mini 750 measures 1192mm (including membrane and filters) wide by 508mm high, while the 550 measures 964mm (including membrane and filters) wide by 508mm high. R Electronics is the Australian distributor for HRO Desalination, Lumitec LED Lighting and OceanView Thermal Imaging Cameras.